﻿﻿﻿﻿Welcome to G2 Barn Hunt. ﻿﻿Lorri Griffin is a premier barn hunt trainer with numerous titles through the Championship level (RATCHX38. She is currently competing with her 4 year old American Staffordshire Terrier, Flea who just obtained her RATCHX38 and is the leading Am. Staff in Barn Hunt and Tig a 3 year old Rat Terrier who is the #1 Rat terrier in Barn Hunt with a RATCHX6 She has also run clients dogs in trials, including Gill Chapman's 10 year old Border Collie, Luke who has obtained his RATCHX12 and retired as the #1 Border Collie in Barn Hunt in 2017. She is dedicated to bringing out the best in all types of dogs, she specializes in figuring out what makes the dogs hunt and what gets them excited to "Get that Rat." She not only owns and operates a rattery, where she breeds performance barn hunt rats but she works as a chief rat wrangler for hire and is able to supply an entire trial with quality male and female rats. 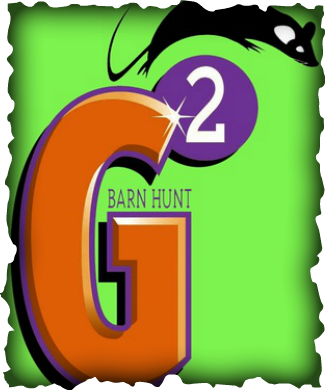 G2 Barn Hunt is located in central Florida close to Ocala and Gainesville in the town of Morriston. The sport of barn hunt is relatively new, Lorri Griffin has her finger on the pulse of the hunt. She works as a trainer, trial secretary, and rat wrangler and is available for hire to put on trials. She is available for lessons and seminars. Barn Hunt classes are offered several times a week as well as private lessons. Like all of G2 Dog Sports, she truly believes that her success is linked to her students. So come on in and check out the fun that is barn hunt!